One of the first Indian artists to come out of the closet and talk about alternative sexualities, Bhupen Khakhar’s art practice was informed by a vibrant radicalism. Fifteen years after his death, as the Indian market begins to appreciate his genius, a look at the enduring legacy of his art and why he continues to be relevant today. When Tate Modern, London, held a retrospective of the late Bhupen Khakhar’s work in 2016, it titled it “Bhupen Khakhar: You Can’t Please All”, after a 1981 oil painting by the artist. The painting it referenced featured a naked male figure leaning across a balcony, watching an ancient fable play out below. A father and son were on their way to a market with a donkey. On the long trek, they took turns at riding the beast. At each turn, passers-by had an opinion to offer on who should be riding the donkey. In the end, the father tells his bewildered son: “Please all, and you will please none!” Painted a year after his mother’s death in 1980, the work is cited by British artist Timothy Hyman as Khakhar’s “coming-out painting”. Artist Bhupen Khakhar’s oil paintings were often narrative and autobiographical, with his first exhibited works presenting deities cut from popular prints, glued on mirrors. Robust colours, erotica and something from everyday life – Bhupen Khakhar’s exhibits offer all of this and a lot more. The collection of 149 art works, on display at the Swaraj Archives in Noida, stands testimony to the process of the famed artist’s spectacular trajectory. Former NGMA director Rajiv Lochan, who has curated the show “Liberation, Revelation/Representation: The art of Bhupen Khakhar”, describes the artist’s approach as “naive, supple sensuality”. Something as mundane as a dog, a donkey or a wall clock were a source of inspiration to him, as were complex physical encounters – hetero or homosexual. Lochan said Khakhar’s lack of formal art education worked in his favour, allowing him unconditional freedom of thought, content and expression. “The unskilled part was his strength,” Lochan told PTI. The show seems not so much about individual artwork as it is about the journey of the artist who died in 2003. Robust colours, erotica and something from everyday life – Bhupen Khakhars exhibits offer all of this and a lot more. The collection of 149 art works, on display at the Swaraj Archives in Noida, stands testimony to the process of the famed artists spectacular trajectory. Bhupen Khakhar established himself among the very few Indian artists who have been celebrated both within the country, as well as internationally during his lifetime. 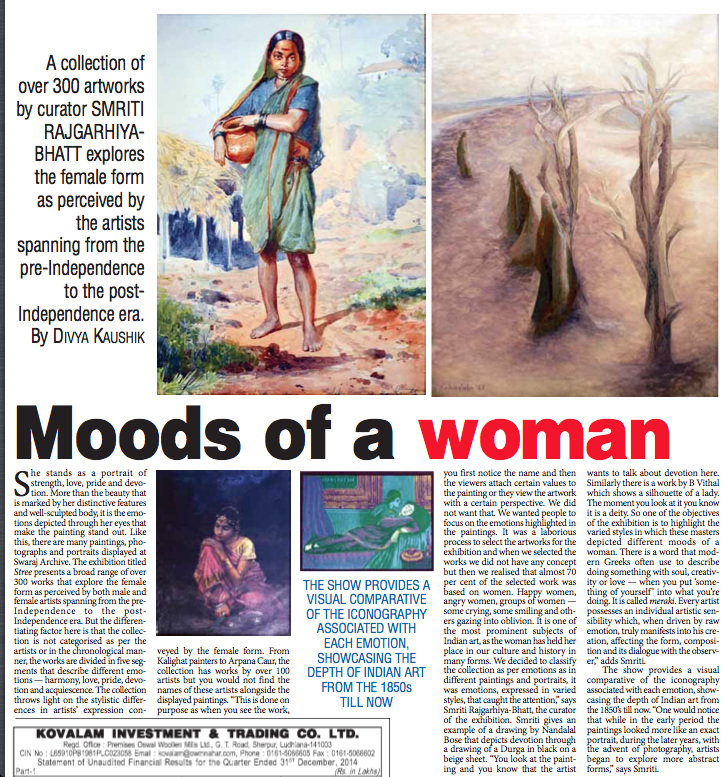 The works of the deceased artist, titled Liberation / Revelation / Representation, at Swaraj Art Archives in Noida, will showcase realities of the everyday and personal fantasies fuse to form an inimitable language unique to the artist. One must also not to forget that he lived on his own terms and his artworks reflected his personal preferences and priorities. Contemporary artist Arpana Caur’s major retrospective at NGMA Bengaluru shows how her art is triggered by the immediate environment. 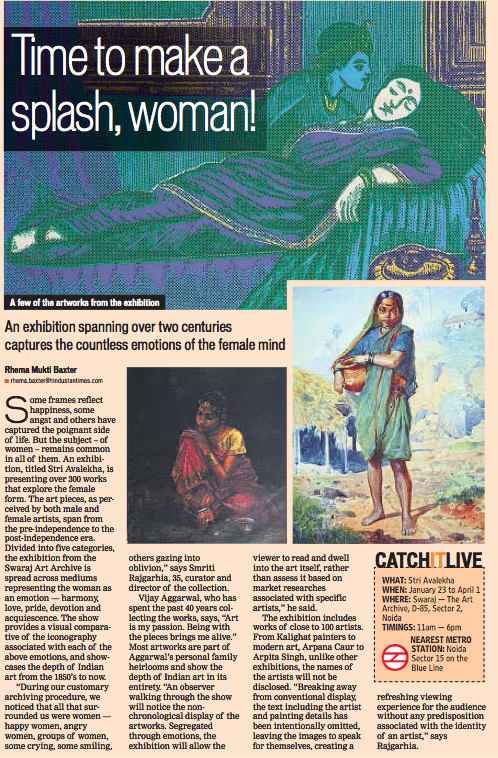 In her one and a half-day visit to the city, she could only accommodate setting up the show at NGMA Bengaluru for her retrospective “Four Decades: A Painter’s Journey” and its opening. But then the senior artist thinks from her heart. So, there she was at Venkatappa Art Gallery on the morning of the day she was to fly back to Delhi repainting her mural. “The mural had become dull. The work deals with Buddha, one of my favourite subjects and makes an important statement. I don’t come to Bangalore often and just wanted to utilise the opportunity,” says Arpana. That is Arpana Caur’s approach to art and life. Reaction and responses to the surroundings make up the oeuvre of this seminal contemporary artist. Extending this philosophy outside the canvas, she has led battles against illegal encroachments on a heritage building; set up a folk art museum to preserve some rare paintings and runs a vocational school for underprivileged girls. Arpana Caur — whose retrospective opens at the National Gallery of Modern Art, Bangalore, this month — on how she came to be an artist, living through the 1984 anti-Sikh violence and why scissors crop up on her canvases. This is one of your biggest shows, spanning four decades of your work. Do you think the works represent your various engagements over the years? I was surprised to see all the work that Vijay Aggarwal from Swaraj Art Archive (organiser) had purchased. Almost all the subjects that I have worked on are in the show, from Buddha and Guru Nanak to environmental concerns, the widows of Vrindavan, and the 1984 genocide. I cannot imagine why someone would want to buy such dark works. When I look back, I feel a lot of my previous work was too dark, too heavy. Earlier, I did not realise that I put everything out there, it (my canvas) was filled edge to edge. In the last decade, that has changed. I have realised an element of abstraction is important; the negative space is actually a positive one. Now, my canvases are less crowded, and the figures minimal. Her flight delayed by Delhi’s infamous smog, artist Arpana Caur arrives a couple of hours later than scheduled in Bengaluru, where her retrospective show ‘Four Decades: A Painter’s Journey’ is to open the next day. Veteran artist Arpana Caur, whose painting was once bought by M.F. Husain, is part of a retrospective show, which is soon to be hosted at the NGMA, Bengaluru. This will be a rare chance for us to explore her life’s work, writes Bhumika Popli. Who am I to choose the name ‘Amrita’ for myself?” the Delhi-based artist Arpana Caur was confronted with this thought when she was 15. Until this age, she only had a nickname — which she wouldn’t reveal to us — and not what most of us would consider a “proper” name. So as a 15-year-old, she had to choose between two names, Amrita and Arpana, both of which had been shortlisted by her. “I was hugely inspired by the painter Amrita Sher-Gil and I would have liked being named after her but decided against it. She was such a great artist and I didn’t feel that I could match her stature.” So Arpana it was. The young girl at the time didn’t know that she would go on to make a name for herself in the world of visual arts, much like Sher-Gil had done so many years ago. Siberian Cranes may be reluctant to migrate to Delhi in larger numbers during the winter, but culture vultures returned in hordes to pay homage to the mecca of art aficionados that Delhi welcomes at the close of January every year. The India Art Fair opened to its usual enthusiasm but was greeted by a rather sombre tone; a much wilted, watered-down rendition from last year. From the flowing wine that usually paints the mood to the march of Jimmy Choos and Louboutins, even the air kissing seemed more utilitarian somehow. The scale of the galleries and the number participating is definitely Spartan compared to last time. More focused, less sprawling but still engaging, a treat for art lovers nonetheless with tons to gawp squiffily at. Here is our list of five must-sees: Read more here. To call it a delightful slice of history would be an understatement because what’s on view at Tasveer Art Gallery in Bangalore is much more. Not only because the selection of vintage prints introduces the viewer to a bygone India but also because the man behind the lens was the incredible Sunil Janah. The Assam-born photographer documented some of the most seminal events between 1940 and 1960 — the Bengal famine, the freedom struggle, Partition, tribal studies… yet we don’t know much about him. The celebrated American photographer Margaret Bourke-White asked for Janah to accompany her to document the famine in Andhra Pradesh and Mysore for Life magazine. P.C. Joshi, a leading figure of India’s communist movement, asked Janah to accompany him to the famine-stricken Bengal in 1943. His graphic images of heaps of skeletons and a dog devouring human flesh shook everyone. – Read more here. Swaraj Art Archive houses rare and significant artworks from the 1900s to the 1980s.